Food safety is now more hazardous because organisms are stronger and more virulent. The need for food safety, particularly in the food service industry, is growing more important each day. Food service is one of the largest businesses in the U.S. and employs 1/4 of the nation's workforce. In fact, it has become a global industry, and its size and diversity have created regulatory problems. This is why safe food is such a challenge. 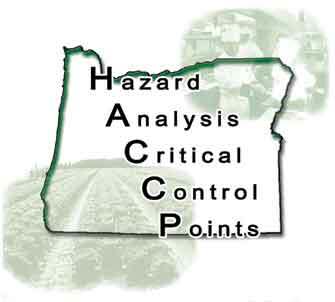 The original Food Safety Chef Steven R. Davis, C.E.C., has been hosting Wholesale & Retail Food Alliance (WARFA)-sponsored HACCP workshops in Florence, Oregon since October 2006. Now you may save on consulting fees and wasted time by attending a two-day comprehensive, fun, interactive workshop where you will create your HACCP plan and learn how to update it. You will also find out how to become a HACCP trainer. The train-the-trainer course is a course that may be taken and given individually to persons that complete and are certified by WARFA in HACCP. This will allow you to train others in basic HACCP principles. Find out the details by going to HACCP workshops. Chef Steve also offers online training for the food service industry. You can find food safety training materials on the WARFA site that will enable you to obtain Food Safety Certification for Managers, Chefs and Supervisors by the time you finish the coursework and take the tests. Online training for HACCP1 certification is now available (as well as on-location HACCP workshop training). This course introduces the HACCP recipe (the key to the HACCP process whether your wholesale or retail operation is a simple hot dog stand or a huge sausage plant) and teaches you how to write (or rewrite) and implement your HACCP systems plan. The programs are also designed to train you in the laws and regulations relating to food service safety and sanitation, and to update you on changes to those laws. Let the original Food Safety Chef equip you with the tools you need to become a qualified and valuable food handler in the 21st century. For further information, email steve@chefsteve.com, call 1-541-997-7737, or write to Chef Steven Davis, P.O. Box 1441, Florence, OR 97439. Fax: upon request. Disclaimer: ChefTrain.com is not responsible for presenting current information for specific city, county, state, and federal codes.